Anyone who knows me in real life knows this for certain: I love rolls. Let's be honest, I just like breadstuffs in general. But rolls? I mean, hold me back. I suppose I should add a caveat - they have to be soft and buttery and delicious. Those hard rolls you have to practically break a tooth getting in to? No thanks. That is not what rolls are about. These are so good. If I hadn't been having some kind of weird stomach issue, I surely would've eaten way too many of them. That being said, they are sort of time intensive. But oh so worth it. Grease a 10-inch round springform pan with nonstick cooking spray. Surely you can use a different size pan and still make these, but what's the fun in that? Place the pan on a baking sheet. 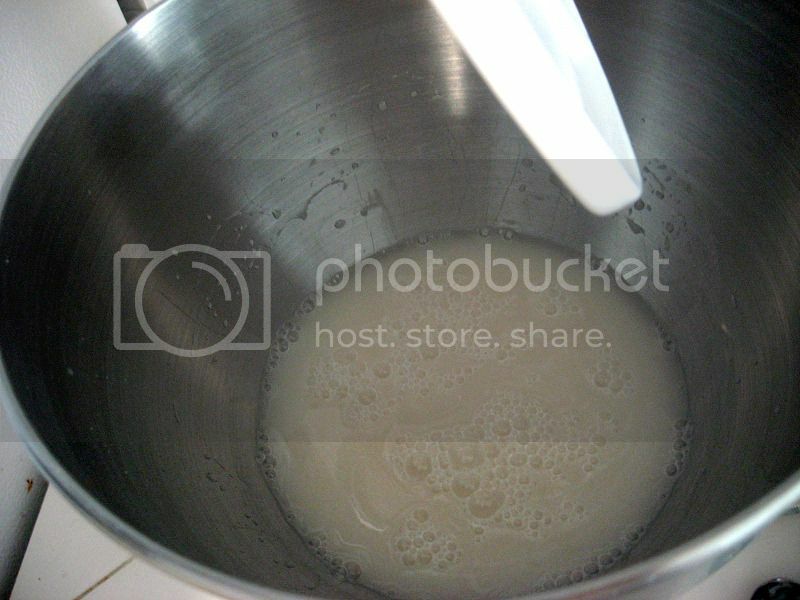 In the bowl of an electric mixer (using the paddle attachment), mix the water and yeast briefly and then let stand until the yeast has dissolved, about 2-3 minutes. 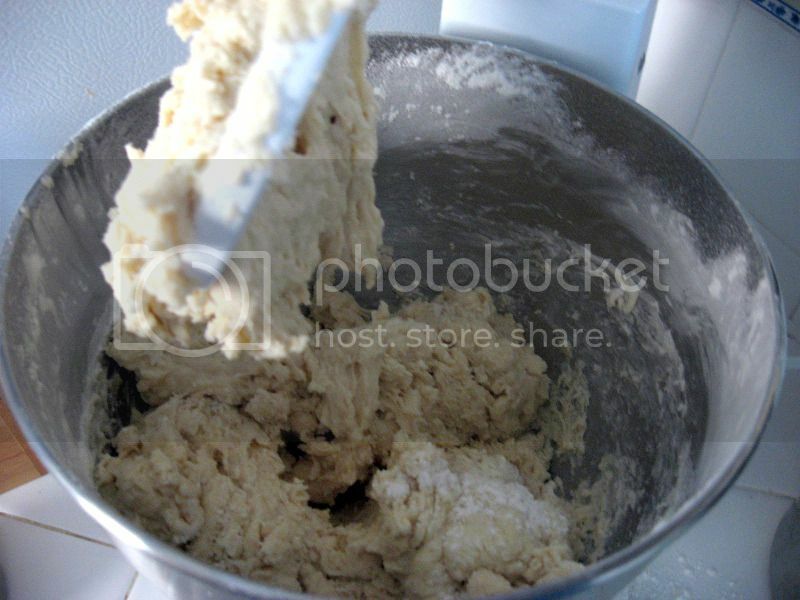 Mix in the sugar, salt, eggs, stick of softened butter, and 5 cups of flour until the dough forms a soft mass. Switch to the dough hook and knead on low speed for 8-10 minutes, adding more flour a tablespoon at a time until the dough pulls away from the sides of the bowl. Transfer the dough to a lightly floured work surface and shape into a ball, with your hands! It shouldn't be very sticky, but if it does a little, just make sure your hands are either wet or covered in flour. 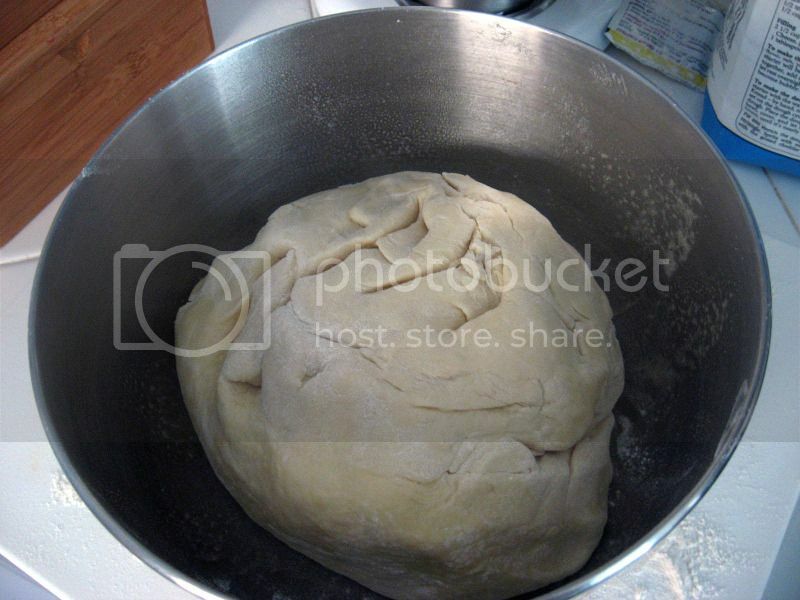 Spray a large bowl with non-stick spray, and place the ball of dough in the bowl, turning the dough over so both sides are coated. Cover loosely (I'd recommend a towel) and allow the dough to rise until almost doubled in size, about 45 minutes. If you've got a drafty place, just stick it in the oven. The OFF oven. 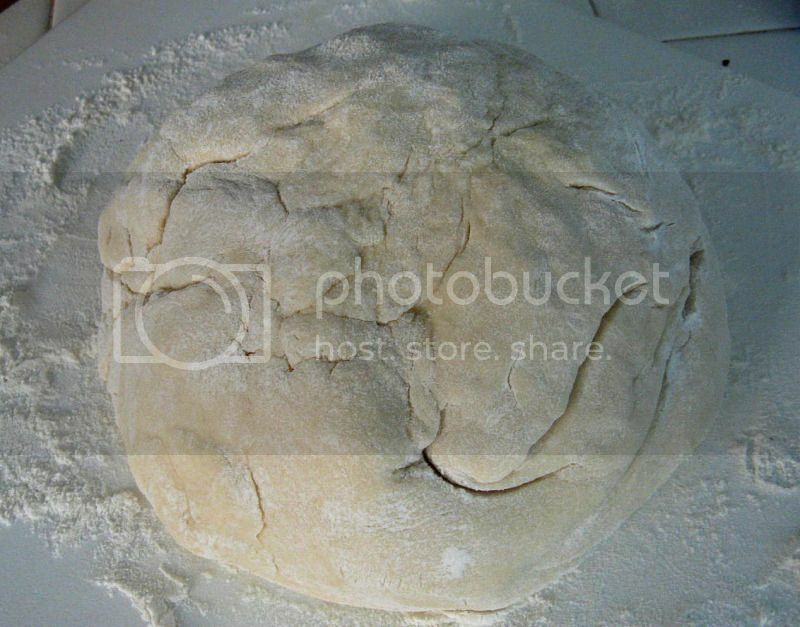 Punch down the dough to deflate it, then leave it alone to rest for 20 minutes. Return the dough to the lightly floured work surface. 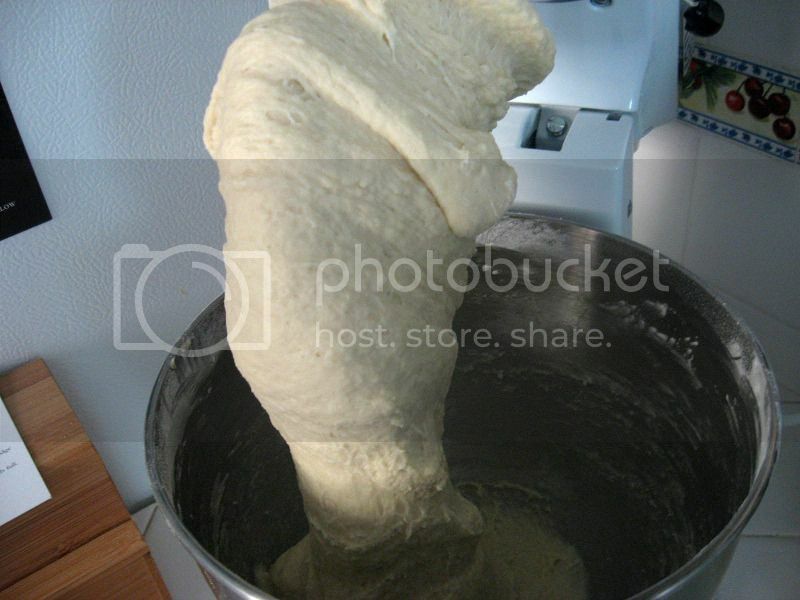 If the dough looks like it rose back up at all, gently deflate it. 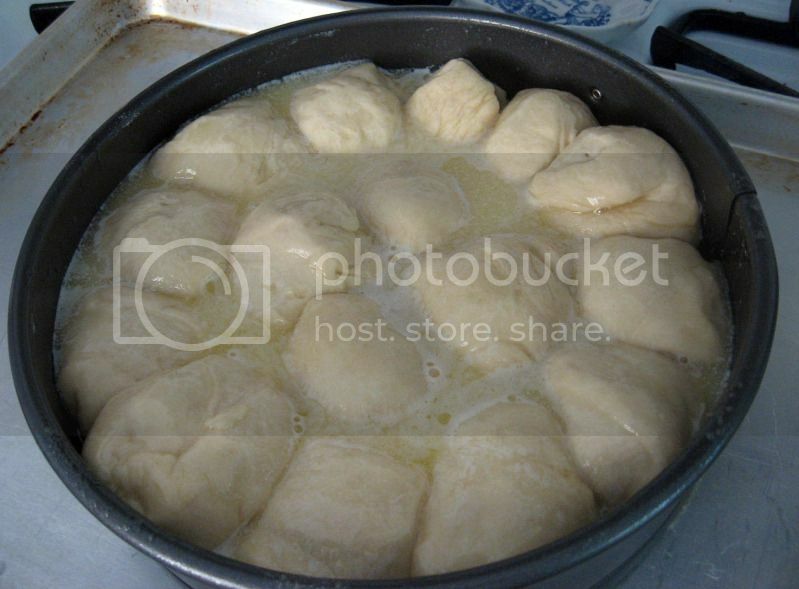 Divide the dough into 12, 14 or 16 equal portions and roll into balls, then place them in the pan. You might think they won't all fit, but rest assured, they will, just squeeze 'em on in. 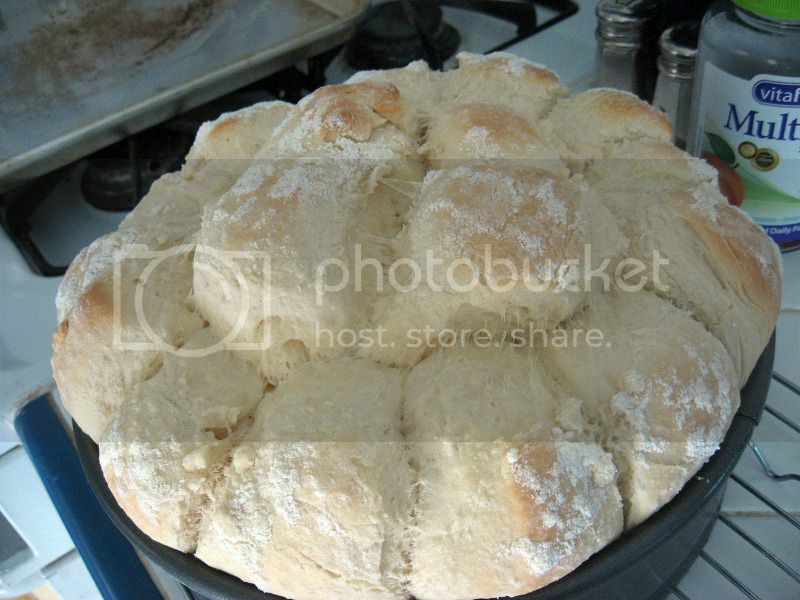 Brush the tops of the rolls generously with the melted butter and then dust with flour. 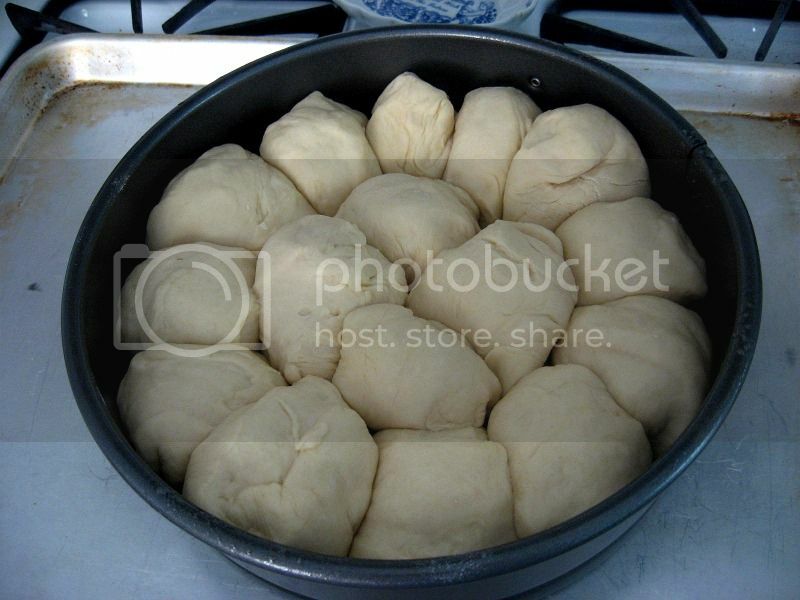 Cover the pan loosely and allow the rolls to rise for 20 or 30 minutes, until very puffed up. Preheat the oven to 350F. Place the round pan (which is on the baking sheet) in the oven and bake for 30 to 35 minutes, until golden brown. You may want to line the baking sheet with parchment if you don't want melted butter all over it, just FYI. Lift the round pan off the baking sheet and let cool on a wire rack for 30 minutes, then unclasp the springform pan and remove from the rolls. Serve at room temperature or still warm. Delicious! 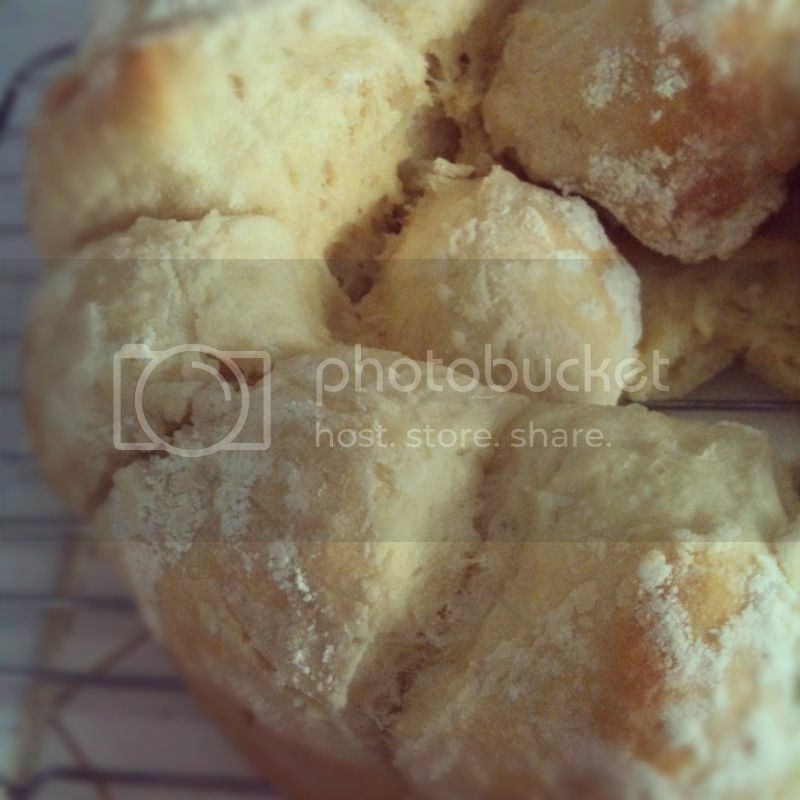 After you've added in the sugar, salt, eggs, stick of softened butter, and 5 cups of flour, it'll look shaggy like so. Oh look, it's a bread dough alien! This is after it's been kneading with the dough hook, more Tbsp of flour added in. 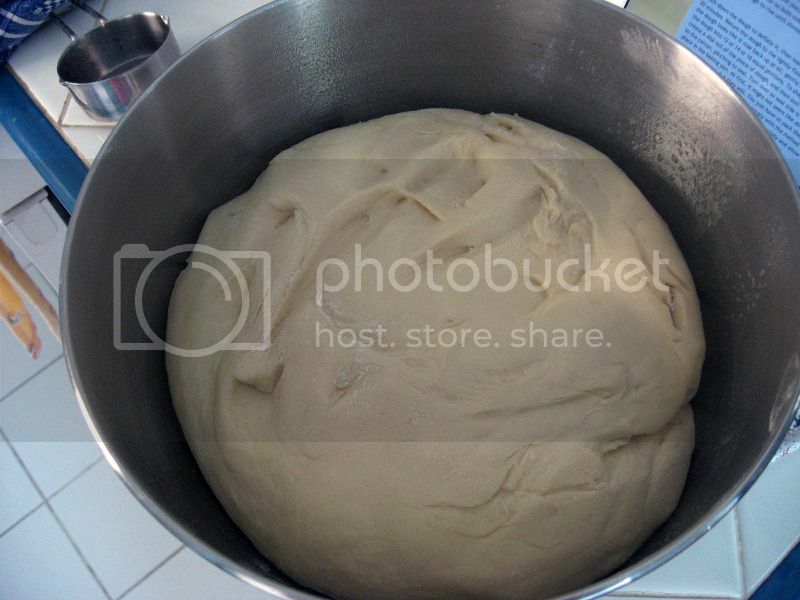 Place the alien dough onto a floured surface and shape into a ball. Place that ball into a non-stick-sprayed large bowl. Let it rise for 45 minutes. It'll have risen, like so. To get this many rolls, I put the dough back on the floured surface, cut it in half with a pizza cutter, then cut those halves into 8 pieces each, rolled them up, and voila, 16 rolls. 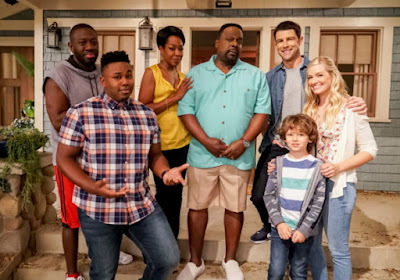 Holy CRAP, that is a LOT of butter. My! How much they rise in the oven! Mine could've really used probably a few more minutes in there, the middle was still a bit doughy. Doughy, but delicious nonetheless. 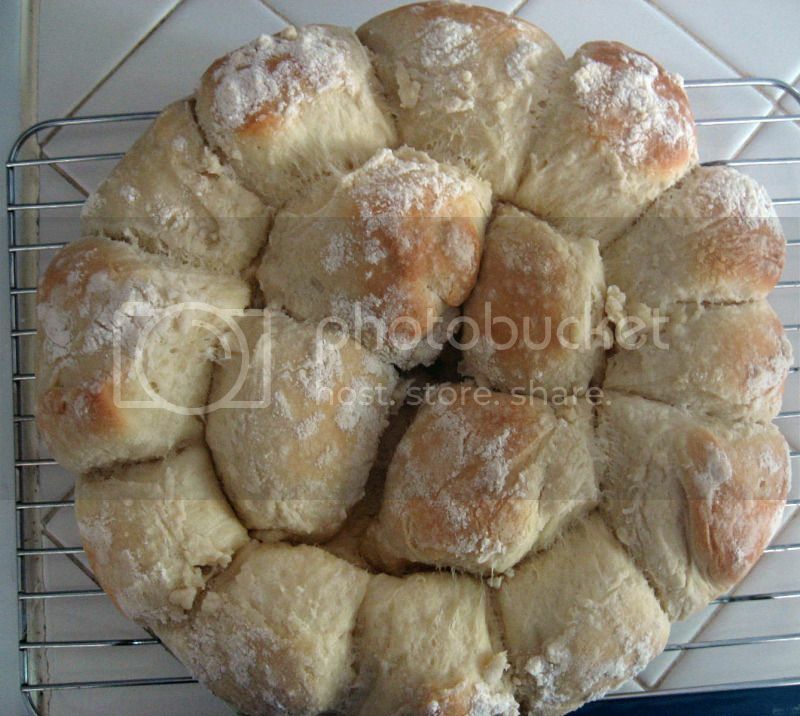 Mmmm.... seriously, if you like these types of soft rolls, you'll love these.